This Super Penthouse, on the Beach, 3BR/3BA, CHECK THE REVIEWS!!!! BE SURE TO INQUIRE ABOUT OUR TIMELY DISCOUNTS AND OTHER PROMOTIONALS ON VACANCIES AND LAST MINUTE ACCOMMODATIONS. YOU COULD SAVE YOURSELF HUNDREDS OF DOLLARS. Dreams and memories are what it's all about and here in Cabarete you will have both. The whole family will find what they need to make this vacation most memorable with loads of activities for everyone, no matter if you want to lounge by the pool, on the beach, tour the area taking in the sights, sounds and leisure activities or participating in some of the activities Cabarete is so well known for. Cabarete is called the 'Kite Boarding Capital of the World' where the beauty of this sport is visible on almost any day. Wind surfing, wave surfing, snorkeling, sailing are other activities that if you haven't tried them you will find any number of locations ready and willing to teach you. For the golfers there is Playa Grande 20 min to the east and Playa Dorado just past the Puerto Plata Airport. These ocean side golf courses are among the finest and most reasonably priced golfing destinations in the Islands. Don't forget Sea World in Puerto Plata where you can swim with the dolphins, get within inches of some of the most beautiful tigers in the world. Truly an experience for the whole family. Night life in Cabarete is abundant with world class restaurants, where you can find cuisine from all over the world including Spain, France, Germany, USA and even Asia and of course, the Dominican Republic. The nights are also busy with casinos and beach bars galore with all the excitement a person could ask for. There is an abundance of shopping that consists mostly of hand made Dominican treasure that once purchased will give you years of enjoyment and memories. From the time you enter the front door you are greeted with the custom furnishings and decorations, the size and the extraordinary view that will WOW even the most worldly traveler. Entering, you will find an impressive great room with 15' cathedral ceilings, a very relaxing entertainment area to your left and the semi formal dining to your right. Belly up to the kitchen bar area to join in on all the conversation in this truly casual, relaxing setting. Just beyond, you'll find the huge terrace with the most beautiful panorama featuring a 180 degree ocean view. Our condo is equipped with all the necessary amenities, including a W/D, designed with your comfort in mind. Daily maid service (except Sunday) is included, a cook/catering is available at an extra charge. So, after an invigorating day of fun filled activities, whether it is on the beach, by the pool, on the golf course or where ever, your accommodations await you at THE VICTORIAN LUXURY CONDOMINIUMS. Bette and I are retired and travelers like yourselves and have stayed in the good, the bad and the ugly and because of this we are determined and dedicated to providing the very best accommodations. You will find a fully equipped kitchen, no jelly jars, with everything you need to make life beautiful, the furnishings throughout are custom made and cared for by our staff of wonderful people to make your experience reminiscent of all the other folks who you will read about in the reviews. Look at the pictures, need I say more!? Bedrooms completely air conditioned for those odd hot nights. There is ample sets of all linens and bath towel sets. place settings for 16, plenty of wine glasses, no jelly jar glasses allowed. All you probably have at home and more. As time goes by we seem to be accumulating a library of books in several languages left by guests. Stayed with husband, 2 adult children & an 18 month old. This condo was perfect for our stay. Been to Cabarete several times and this was our best. The condo is so spacious and feels even bigger with the vaulted ceilings. The huge deck fronting right on the beach is amazing - always a breeze and the roar of the surf. A great spot to hang out and for meals. The owner, Ron, is great to work with. He provided so much helpful information and has the home so well-equipped. From the fully equipped kitchen, to lots of closet space and big chests of drawers in the bedrooms, to great bathroom lighting, daily maid service and best of all for us a portable crib and high chair, they have it set up perfectly for a relaxed and comfortable stay. I loved being able to take long, long beach walks every day. We have stayed in the Kite Beach area before, but like this better for the quiet and the ability to play with kids in the sand and stroll without being in the way of the kite surfers. We will definitely stay here again on our next Cabarete trip. It is about a 2/3 mile walk to the supermarket and town along the road. We did walk it but mostly drove. When renting from VRBO I always read the reviews posted by previous renters to help me decide whether to go forward with a rental. The previous reviews for this condo and its owners are spot on. This condo is absolutely gorgeous and spacious and sparkling clean due to Milagros' hard work. It has everything anyone could ever need for entertainment and cooking needs. Ron and Bette, the owners, go way beyond usual means to ensure that your vacation stay will be memorable. They provide every scintilla of information to ensure that your time in Cabarate will be worry free. Ron even set up a crib for our grandson who was with us for the first week of our stay. Along with the incredible Milagros, Ron hooked us up with reliable transportation to and from the airport. On top of that, his friends Randall and Teresita and John and Fay made us feel incredibly welcome at the condo development and Cabarate in general. I'm not going into detail about all the recommendations Ron made about restaurants and tours because they are myriad and all I need to say is follow them. The restaurants in Cabarate are fantastic from the expensive to the less expensive. In summary, this is a rental I can't recommend highly enough. Ron and Bette, we can't thank you enough for all the perks and for making this a holiday we will never forget. Bette and I enjoyed the journey with you and appreciate the wonderful comments and hope we have an opportunity to hear from you again---------Oh yea, your check is in the mail, HAH!!! This was one of the best places we have stayed for a vacation. Just so warm and welcoming. Very comfortable and exquisitely well equipped. Loved it all! Plus a fabulous view! Bette and I are so happy you enjoyed your stay. Milagros(house keeper) and Maribel(cook)asked me to give you an extra special thanks for your generosity. Thanks so much, Toni and Ron for this review. Bette and I thoroughly enjoyed meeting you two and look forward to seeing you this upcoming season. We are a family of 5 (2 parents and 3 kids in their early 20's). We are frequent travellers and have used the vrbo.com website often for booking condos. We can honestly say that this condo, as well as its owners, are the best we have come across in a long time! From the moment you walk in to the condo, you are treated to a beautiful view and comfortable surroundings. 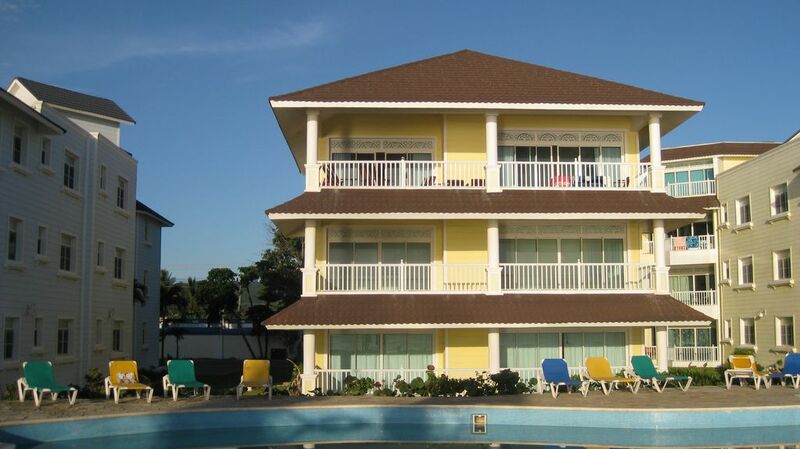 All the rooms are spacious and well kept and we thoroughly enjoyed the beauty of the place. Having our morning coffee out on the porch was the best part of our day! Milagros (the cleaning lady) kept the place spotless and was extremely pleasant. The owners, Ron & Bette, are the most wonderful people. They sent us tons of information by email before we left and this ensured that we never felt uncomfortable during our travels. They also told us about many places that we never would have found on our own. All their advice is excellent and we tried to do as much as we could during our stay. Make sure to take a trip to Caleton beach. The beach is amazing and private. We ordered a meal from Miguel and were treated like royalty. A full meal with drinks was served ocean side on a table for an extremely low price. We also took Wilson's river tour and had another amazing day. Wilson is a great person and the staff kept us entertained and happy. A trip to the 27 waterfalls is recommended. Lots of fun and the beauty of the place is outstanding. We tried as many of the recommended restaurants as possible. The meal at Casa di Papi was excellent and we ate twice at Ali's Surf Camp. Great food and amazing atmosphere. Had several meals on the beach and were never disappointed. Make sure you have Maribel come to cook for you. She is a lovely person and the food is delicious. Do this early in your stay as you will have leftovers! Rented a car from Carlos who also picked us up and dropped us off at the airport. Driving yourself is the way to go! Although not for the feint of heart, you get the hang of it quickly and it gives you more freedom to try all the recommended spots. Our family is very sports active and we spent several days surfing. Board rentals are not expensive and the beach is lovely. Took Kite boarding lessons and had a blast! Even if you don't want to try, spend a day at Kite Beach just to watch. It's a good time. What else can we say except we want to go back!! Again, many thanks to Ron & Bette for allowing us to stay at their beautiful condo and for all their wonderful advice! Thanks so much, Pat, for sharing your wow experience with us during and following your stay at our place in Cabarete. Bette and I are devoted to doing what we can to help maximize you fun and enjoyment while staying in our beach front condo. Rest assurd I will pass your comments onto all those, Milagros, Carlos, Wilson and Maribel, who work so hard to make your stay so memorable and fulfilling.